Another wine recipe to prepare for this Christmas but this wine may take slightly longer to taste best.Though I have tried a red grape wine and have posted in my space long back but this one is slightly different in preparation.It has more of sweet flavors,I loved this wine a lot.I served it to our friends too and they liked it very much.Do give this a try if you plan to serve it on New year's eve or later as this wine takes time to mature.Happy Thanksgiving to all too !!! Wash the grapes after removing the stalks and under running water.Dry the grapes on a paper towel.Slightly crush the grapes with your hands just to open the tip.Put them into the cleaned jars with sugar and other ingredients alternating each layer. Add boiled cooled water to the jar.Close the lid tightly and leave in a dark place.The jar can be just shaked without opening every 5th day so that the contents are mixed well. Open the lid on the 21st day and you see all grape skins float to the top with nothing inside. Drain the liquid part with out shaking the bottle much and strain it in a cheese cloth.Don't try and squeeze the strained contents. * I used the Indian green grapes available in Indian grocery stores,you can use any other variety too. *Although the wine gets clear as it sits over days but if you wish to speed things,add half an egg white if you wish to get a clear crisp wine on the 15 th day before decanting. *Good quality glass jars are required otherwise it may sometimes burst in the process of fermentation. *You can open the jar if you aren't comfortable shaking it with lids closed but the flavors might be lost. * If you wish to get color,you can caramelize but I haven't tried it yet.Add about 3tsp of sugar in a wide pan and wait till it attains golden brown.Keep stirring slowly,not to burn your hands.Add 50ml water through the sides of the pan at the point where you want the caramelization to stop and stir again.Put off flame,let it cool and add. * Don't use the sedimented contents by squeezing,the actual taste of wine will be lost.The sediments can be discarded. 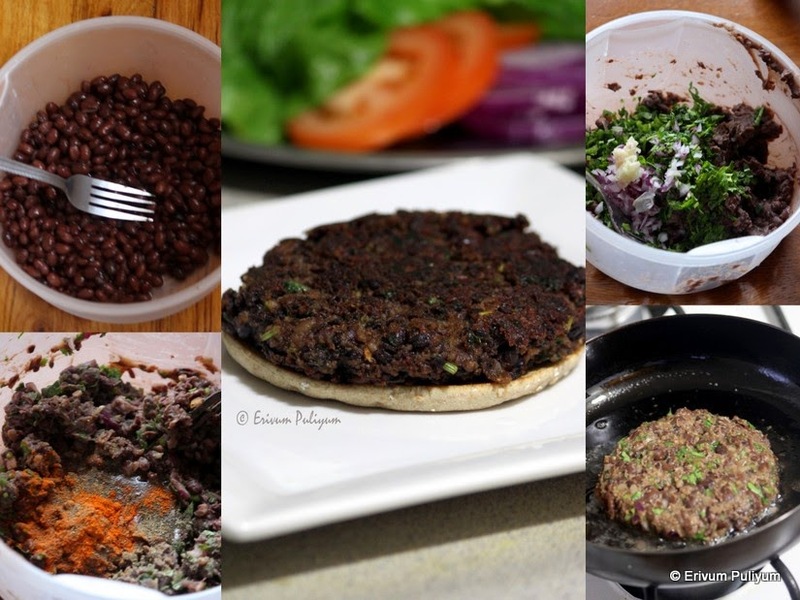 Black bean burger,anyone interested to taste this healthy kind of burger?? I know the first impression of all meat burger lovers would be a big 'no' just like my better half.But when he actually tasted this,the expression literally changed and he liked it.He gave 8/10 for these yummy patties.And believe me,I have already made it twice after my first experiment and we are loving the flavors.A healthy alternative to meat burgers or a change to break the monotony of meat patties.These patties have a unique delicious flavor and I liked the tastes.This can also serve as a quick fix lunch for kids too and a great 'meat patty' in disguise. I saw some ad in papers that the restaurant that serves the best bean burgers in town and when I saw the pics it was mouthwatering.That's how I got hooked to this recipe.Immediately,I started my search for the recipe until I reached here and was happy to try it out.I have used whole grains sandwich thins instead of the regular hamburger buns just to avoid all purpose flour.But you can always use hamburger buns if your family loves it that way.Top it with your desired veggies and serve,enjoy the healthy patties !!! Drain the water from black beans but don't rinse.If you are using dry beans,then soak it for 4-6 hours and then cook in a pressure cooker for 3 whistles or until cooked well.Drain water and use. Mash the beans in a large bowl using a fork until everything looks broken (a few tid bits are acceptable).Add the seasoned bread crumbs,egg,minced garlic,onion,chopped mint/cilantro/parsley,chilli powder,pepper powder,cumin powder and salt.Let it sit for 5 mins. Mix it well and make two/three(depending on thickness) equal portions.Form large patties in your palm(these patties will not shrink after cooking) and then heat a pan with oil or butter. Repeat the same step for remaining two/one patties. Now in another pan ,heat the sandwich thins or burger buns until slightly toasted.Add mayonaisse + tomato ketchup or ranch and then place the cooked patties.Top it up with lettuce,sliced tomatoes,sliced onions and pop the lids or the top cover.Pierce a tooth pick in the center to hold the burger intact. Voila ,black bean burger is ready to serve !!! * You can use 1/2 cup of dry beans which yield 1.5 cups of cooked beans after pressure cooking. 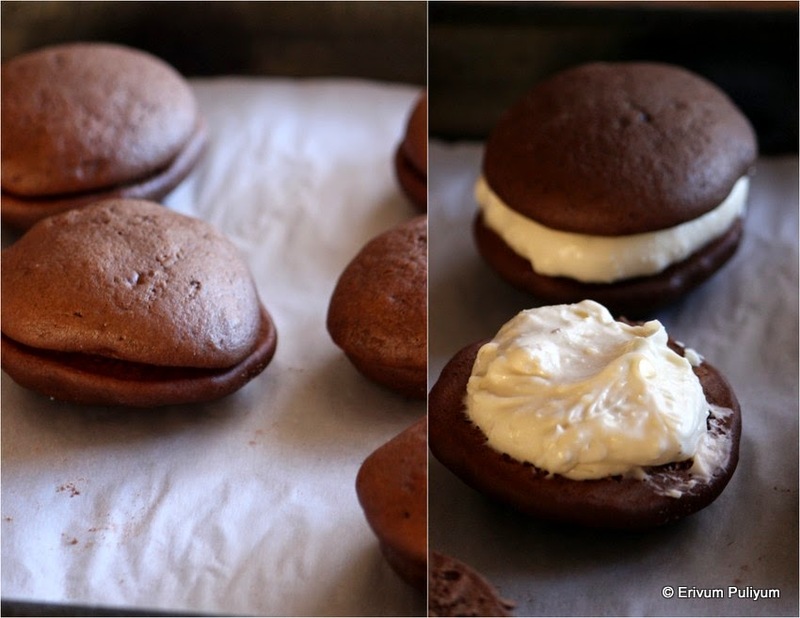 * It makes two patties but I made it slightly thin and got three patties. * You can substitute the egg by some other ingredient that kinda holds the black beans together.The egg helps binding together and adds flavor too. * I used mint leaves but you can use cilantro/parsley. 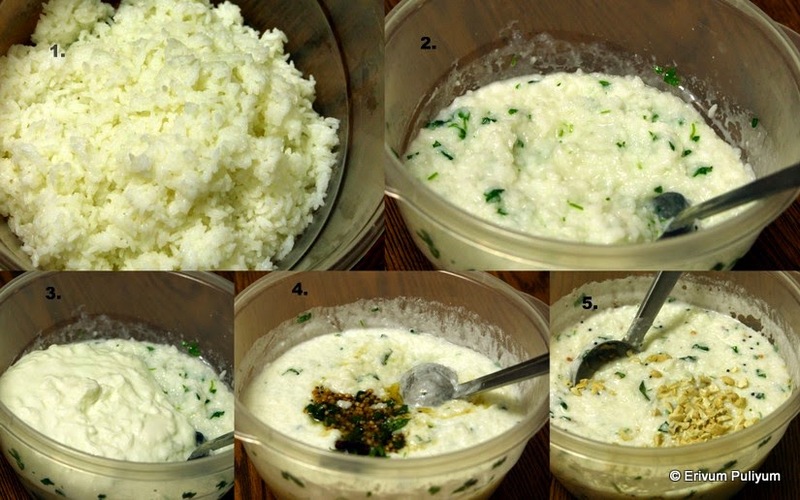 Thayir Sadam(Curd Rice) is a popular rice from South India and this is the best comfort meal in summers.As the name suggests its curd and rice put together to get a simple yet satisfying meal which can be relished with just a touch of pickle or just like that.We love this very much and usually prepare it on some weekends.Summers are the perfect time to enjoy this meal and this is an old draft which longed to be out soon.This recipe doesn't require much expertize to cook and the only thing to keep in mind is the selection of rice(the cooked rice could be mashed easily).Do give this simple rice recipe a try if you haven't tasted this yet and enjoy !! 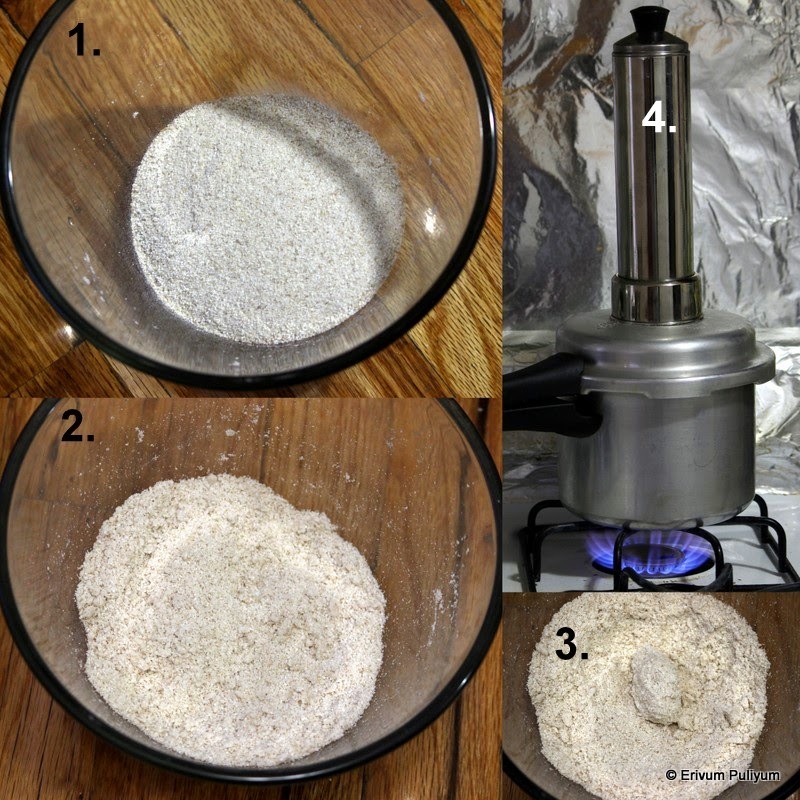 Wash the rice and cook in a cooker by adding 1 1/2 cup water for 2 whistles on high flame.Wait till the pressure is released to open.Transfer the cooked rice to a bowl. Add boiled cooled milk,add cilantro,salt.Mash well with hands. Heat a pan and add oil.When hot,splutter mustard seeds.Add in dry red chillies,curry leaves,urad dal,green chillies and asafoetida(hing). Switch off flame and season on top of the curd rice. Add the chopped cashews and mix well,serve chilled with pickle or just like that. * Use rice that preferably mashes well when cooked.Add water as per the brand of rice to cook.I have used sona masoori. * You can add 1/2 carrot grated too if kids like it. * You can use butter or ghee to temper instead of oil to enhance tastes. 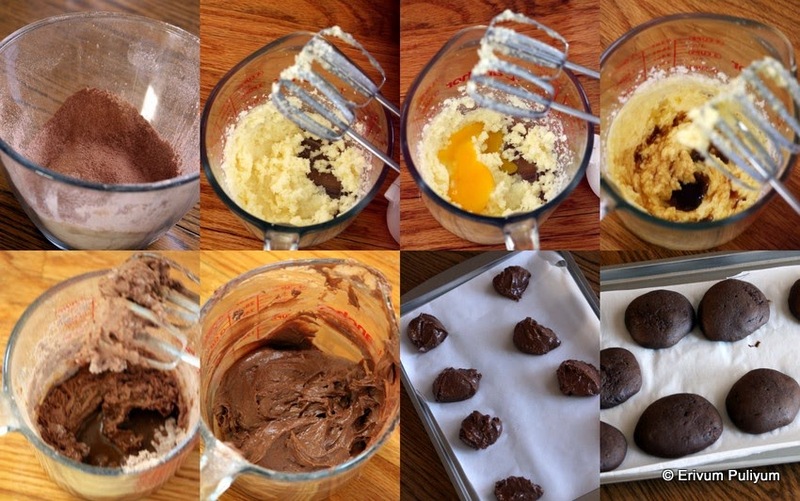 * You can add grated ginger 1/2 " piece too when tempering. * You can temper the cilantro too if you don't like the raw smell. * Add more chillies to spice it up as per preference. How are your preparations for Christmas going on?? Well,I have soaked my dry fruits to make plum cake so far and wines are on the way too.Whenever you peel a pineapple,remember to retain it to make this wine.This is a very simple wine that can be made few days before Christmas and can be served immediately without much delay.This wine needs to be used up soon too unlike other wines.I bought the pineapple to make some pineapple juice but then used the peels for the wine & core too.Please go through the note section before you prepare wine.Do try & enjoy !! 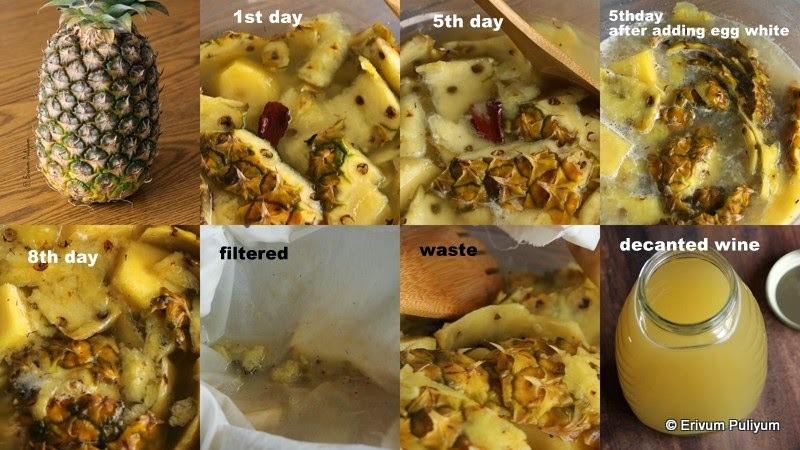 Wash the pineapple thoroughly and cut the peels.Use pineapple for making your delicious recipes,reserve the core and skin for this recipe.Washing the skin afterwards loses its juices.So,wash in advance. Boil and cool 3 cups water.Add in sugar,yeast,cinnamon,cloves and pineapple peels. On the fifth day,add the egg white and give it a quick stir.Close the lid and leave for another 3-5 days. Open on 10th day,decant the wine without disturbing any of the contents or pour over a muslin cloth.Make sure not to squeeze the contents(I decanted on the 8th day as I made it in summers and got ready soon). Pour it in clean,dry bottles (see in pic;the wine looks cloudy on that day)and wait for another 3 weeks (21 days) or more before you actually start tasting the real flavors of this wine.The pics are taken after 21 days,it clears most of the cloudiness. *Use clean,dry glass jar or ceramic containers or earthern ware(bharani).Boil the bottles or ceramic jars in water and sun dry for 2 days or completely dry it to store the wine.Keep ready. * Always use a new clean wooden spoon to stir or mix.Don't use the spoons that use for making curries. * Always add half of the sugar mentioned on the first day and then add the rest on the fifth day.This helps to reduce over sweetness.You can always modify the sweetness as per sweet tooth. 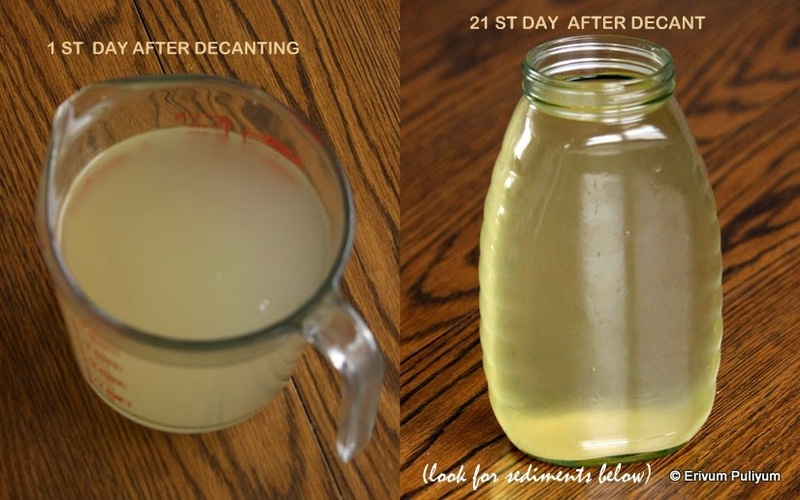 * If you are using clear bottles or ceramic jars then don't open to check frequently. * Egg is added to clear the wine and purifying it.If you omit this step,then leave the wine longer to get the clear pic of wine.Otherwise it may look clouded and unfiltered. *The wine may look cloudy on first decant,give time to filter out and I usually change bottles(clean,dry ones )until I get a clear wine.OR Leave undisturbed and don't shake bottle whenever pouring in glasses as sediments are always present. Sweet sesame balls or Ellunda is a popular snack in India.I used to munch loads of these in childhood days and now my kids love these too.These guilt free snack makes a great choice for kids snacks.The best part is that sesame seed contains many essential health benefiting minerals,anti oxidants and vitamins.Though they come in different colors-white ,yellow ,balck and red but I have seen only black and the white ones.I have used white here as I like its flavor more than the black ones but you can always use black ones to make these balls.It hardly requires any preparations ahead but the secret lies in getting the correct consistency of jaggery.Do give this healthy snack if you like it !! Roast sesame seeds until it starts to pop over medium heat.It may take 5 minutes. Heat a pan,add jaggery and water.Make a syrup consistency,switch off flame.Strain the impurities. Then,re boil the jaggery syrup,cardamom powder and pinch of salt on medium heat.When the syrup reaches the soft crack stage(read notes below),switch off flame.Remove the pan from heat and toss in the roasted sesame seeds. 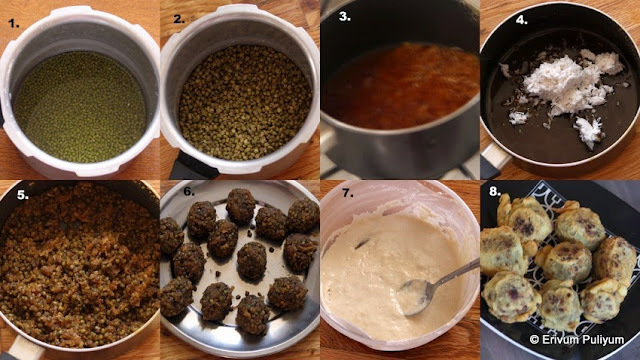 Mix it well,leave aside until its warm to touch or can bear the heat in palms.Now scoop out small balls of mixture and shape in balls.If its sticky use a little oil or ghee to grease your hands and then shape.If the jaggery becomes too dry,then reheat the mixture on very low flame just to warm up and repeat making balls with rest of the mixture.Place the balls on a plate and wait to cool. Serve just like that or store in ziploc bags after cooling. *The staging is as follows-The one thread (230 degrees F)consistency is a familiar one with all;in which sugar forms one thread when pressed between thumb and index finger.After the one thread comsistency,keep stirring the jaggery to avoid burning at the bottom and keep flame on medium heat.Then is the second and third stage where there are two and three threads formation respectively when pressed between the fingers.After this is the soft ball stage,when a drop of sugar/jaggery put in cold water becomes a soft pliable ball.Then comes the hard ball stage,dripping a drop of sugar/jaggery in cold water forms a hard ball. (260 degrees F)Keep stirring to get the next final stage or soft crack stage(270 degrees F)-a drop of syrup in cold water becomes pliable non brittle thread when pulled. (At this stage the bubble formed are less)Any temperature below the soft crack stage will give you a chewy mittai and not the hard ones.It takes 45 seconds -1minute to attain the soft crack stage after the hard ball,so keep a watch closely.